Comments: This is the unit I rely on for all of my timelapse photography. You can dial in pretty much any setting / duration / interval setting. It’s compact and I have one with me at all times – you never know when the timelapse urge will hit! Description: This is a remote switch with an 2.6ft cord and a self-timer, interval timer, long-exposure timer, and exposure-count setting feature. The timer can be set anywhere from 1 second to 99 hours, 59 min., 59 sec. A new dial enables you to easily enter the numeric settings with a single thumb. The LCD panel can also be illuminated. Comments: This is mostly a photography tool that has become an industry standard tool for news/studio/and sports photographers. You can use it to trigger cameras from a distance, or strobes, or as a very fancy time lapse trigger – all at a pretty great distance. This is the unit most photographers use to trigger cameras at the Olympics or other big events – wiring a camera takes far too long and is seldom an option. You can place this unit on your hotshoe and everytime you fire your main camera – it will fire your other receivers (that are attached to other cameras or to your strobe set.) Therefore every time you fire you main camera – you can be firing any number of other cameras from a multitude of other angles all at once. Pretty nifty. For those going to large events where many photographers have these pretty common units – you can request a custom ID/Channel on your set of Wizards. Description (from LPA Design): The PocketWizard MultiMAX Transceiver is the world’s most innovative and advanced digital radio triggering system available in the photographic market. With its sophisticated trigger time control software and transceiver communication capabilities, the MultiMAX model opens up limitless creative possibilities for the professional or serious amateur photographer. 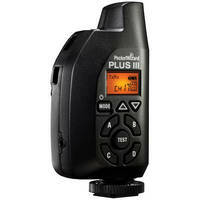 Description (from LPA Design): The PocketWizard Plus III Transceiver is a highly versatile and robust radio trigger that is compatible with all prior FCC-version PocketWizards, as well as most flash and camera systems. Featuring 32 channels to choose from, this transceiver is simple to use in even the busiest of situations. Wireless remote control is possible through the use of Quad-Zone Triggering, which allows you to manage up to 4 zones of remote PocketWizard-enabled cameras or flashes from one position. 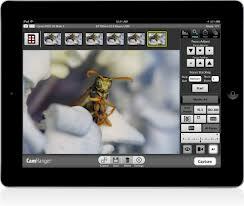 Without having to leave camera position, you can activate and deactivate groups of flashes quickly and easily. This transceiver also employ’s PocketWizard’s Auto-Sensing technology, which instantly allows your device to fluctuate from transmitter to receiver. This technology works directly in line with the Auto-Relay function for a completely remote workflow. Comments: I LOVE this software and the ability to precisely fire your camera with your iOS device (iPad, iPhone, iTouch) – this is a wonderful alternative to traditional methods of firing your camera and you can do SO much more with it. The only catch? You need a spare iOs or Android device unless you want to give your phone privileges away during that all important time lapse… I highly recommend you use the HyperJuice or other powering device with this. 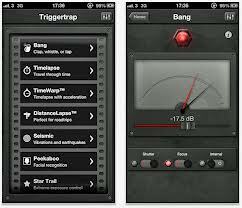 Description: Triggertrap Mobile is by far the best way to trigger your SLR camera from your smartphone. Our apps are completely free and available both for iPhone and Android. Perfect for timelapses, sound triggering, and much, much more. Comments: This is a FANTASTIC tool for time lapse – you can basically control EVERYTHING on your camera remotely with the Cam Ranger unit and this software – exposure, compensation, formats, (you can even fine tune focus at 10X mag) and all of this can be done IN THE MIDDLE of a time lapse… without every touching the camera. Once again consider a HyperJuice (above) or other powering device to keep this going for long time lapses.